RMDs - Required Minimum Distributions and what they can Really Mean to Your Retirement Savings and your Taxes. Can You Afford a 50% Tax Penalty on Your IRA after Age 70 ½? Can You Afford Unnecessary Additional Taxes on Your Social Security and Other Retirement Income? If you're nearing age 70 1/2, or you've just passed it, congratulations! After you've spent a lifetime tucking money into your individual retirement account or 401(k) to grow tax-free, the government is about to make you give it its due with a required minimum distribution. 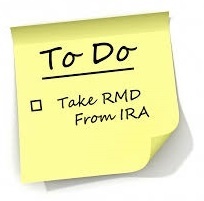 Simply put, a RMD is a way of making you withdraw money from your IRA or 401(k), whether you want to or not, so Uncle Sam can finally tax you on it. You enter the land of required minimum distributions in the year in which you turn 70 1/2. In that year, you can take the withdrawal by the end of the year or wait until April 1 of the following year. After that, you must take your withdrawal each year by Dec. 31. The amount is calculated according to your age, based on IRS estimates of life expectancy. You can find the actuarial tables in Internal Revenue Service Publication 590. If you fail to take your withdrawals -- and the government will know because your accounts' custodians are required to report information to the IRS every year -- you will be hit with a whopping 50% fine on the withdrawal you failed to take, and you will still owe taxes on it. So if you're in the 28% tax bracket, and you fail to take a required $1,000 withdrawal, it'll cost you $780! Should you wait until April 1 of the following year to take that first withdrawal? Probably not. That means you would have to take two withdrawals in the same year, because you'll have to take withdrawal number two by Dec. 31. The extra withdrawal might push you into a higher tax bracket or make you ineligible for certain tax benefits. You still have to take it! It is Uncle Sam’s way of getting the taxes you have been able to defer. BUT – there are strategies that can be used before reaching the magic age for RMDs that can help minimize the taxes. Don’t just sit back and let RMDs reduce your portfolio and potentially move other income (Social Security included) into a higher tax bracket. Come to our next FREE workshop to fully understand everything you need to know about RMDs and RMD allocations to enjoy a better retirement. Please call for event information. Reservations are required & seats are limited.